Sea Escape is one of the two South Sports boats. This aluminium yacht was built in 1982 and totally renovated in 2014. Now she offers diving vacation in Mexico. 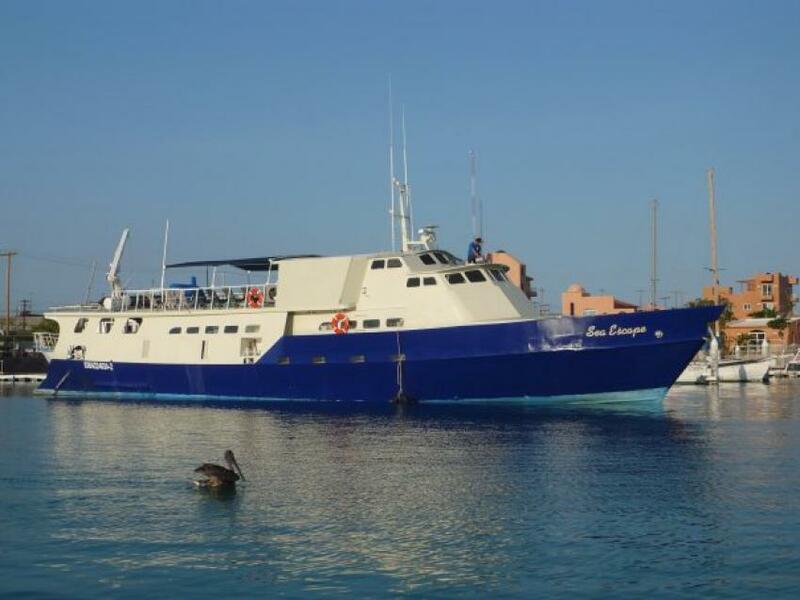 Sea Escape liveaboard can accommodate 18 persons in 8 cabins. 5 rooms are located on the lower deck. Divers can stay in one of the twin rooms or share it with another diver on board. There are also cabins with double and upper single beds, suited for families. On the main deck, there is another twin room.Upper deck cabin has one double and single bed. Most of the cabins are en-suite and has air conditioning. One of the rooms on lower deck has shared bathroom. Lounge area of Sea Escape has a lot of space to relax after diving. Boats living room features with TV and DVD. You can watch a movie or photos made trough the day. There is also a PC for shared use to work with images. Sea Escape has also a shaded sun deck with numerous of sun loungers, where you can enjoy a marine view. Sea Escape liveaboard has all safety equipment: life jackets, rescue rafts, firs aid kit, fire fighting equipment. Crew team is trained to manage emergency situations. Sea Escape’ dive deck has enough space for comfortable preparation for the dive. There are convenient benches, storage boxes and a hanging area for wetsuits. There is also a possibility of diving with Nitrox. Itineraries of Sea Escape include two the most popular and the most engaging destinations of Mexico Socorro and Guadalupe Islands. While diving on Socorro you won’t see a lot of colorful corals. Socorro is all about a variety of marine creatures. White tip shark and silver tip sharks are common for this area. You can also meet big mantas and hammerheads. Socorro can offer a unique opportunity whale watching. While they are migrating they often can be seen near Socorro. Other giant creatures that can be spotted while diving on Mexican destinations is a white shark. A large population of this sharks often seen near Guadalupe. Sea Escape equipped with special cages for this kind of diving. High season for diving in Mexico depends on destinations and creature that you want to see. For diving with white sharks better to choose a time in between July and August. High season for Socorro Islands is from November to May. In between February and April whales can be spotted.